The muddy mining waste has now flowed over about 500 kilometres in the last two weeks, as the joint BHP Billiton and Vale Resources venture tries to protect flora and fauna from the highly-dangerous spill. But sceptics say the mining giants are only trying hard enough to avoid international condemnation. Aquatic life has been annihilated in the severely-polluted Doce Basin and Doce River, with about 280,000 people in the wake of the spill left without access to clean water. Brazil's environment minister Izabella Teixeira has warned that the nation’s “current environmental laws are insufficient to deal with an accident of this magnitude”..
Samarco Mineração faces over $400 million in damages, fines and financial penalties, but Deutsche Bank analysts say the cleanup bill could be over $1 billion, and that it will be years before the iron ore mine could reopen. Brazil’s president Dilma Rousseff says the country will not forget who is responsible for the catastrophe. The Samarco, Vale and BHP joint venture faces a huge lawsuit for the disaster, with a $3.69 billion compensation claim on the table. The suit was lodged by lawyer Pedro Eduardo Pinheiro Silva on behalf of a community in a downriver state. 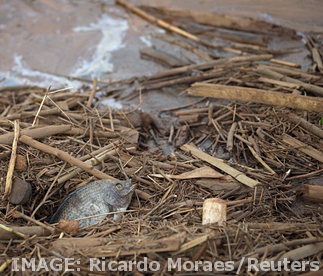 At a recent press conference in Brazil, BHP CEO Andrew MacKenzie apologised for the disaster. Whoever is held responsible will have to deal with the fact that there were warnings about a potential spill years ago. A report from the University Federal de Minas Gerais (UFMG) in 2013 highlighted the environmental risks of mining and the tailings dam in the area. “With the evolution of saturation because of the natural flow of surface water from rain, the area above the equilibrium level would be saturated,” the study said. Samarco CEO Ricardo Vescovi claims he is “unaware of this study”, but Carlos Eduardo Ferreira Pinto, environment coordinator of the Public Prosecutor of Minas Gerais, says the report was delivered to the company and to Secretary of State for the Environment. Engineering researcher Marcos Freitas from Rio de Janeiro´s Federal University says the layer of mud now covering a 30-km radius around the dam is a sterile “floor of iron, a no man’s land”, destroying the fields where animals grazed and crops grew. “It is the biggest environmental disaster in the history of the country,” he said. Among the hardest hit are the Krenak indians, who live on the banks of the contaminated river. The tribe now has to rely on deliveries of clean water and food. “The river was everything for us, not just water, and fish, but a source of survival and culture,” says Krenak chief Leomir Cecilio de Souza. “Since the time of our ancestors, the river maintained our people. It was sacred. But now it is dead”.